It was October 27th, a sunny Wednesday with mild temps and brisk winds. Just over a week into the 2010 bow season. I live in Monroe county, and a quick 5 minute drive from Pittsford brings me to the edge of suburbia. It is a nice location, with plenty of water, feed, and deer action. The day seemed right for me. I remember driving down the highway and thinking it would be a nice evening for bow hunting. I got myself geared up, climber on my back, and away I went. I have a long walk to get to my tree, up and over and one more time before I get to the place I call, "Secret Valley". The buck sign is heavy, trees are ripped apart, and a very tiny creek runs at the bottom. Paths cross the creek, and they are well traveled down to a thick muddy lane. I set up overlooking the area, where a large powerline travels through. It is around 3:30pm when I am finally up in my climber, set up and ready to go. Within five minutes three doe trot down the hill to my right, and straight to the creek. They drink, then pop up and examine the surroundings, ears twitching left and right. Radar is active, always. I just bought a new video camera, (Epic Cam) which I made a custom mount for my bow stabilizer, and I had every intention of getting a buck on film for the first time in my life! I sat quietly soaking in my surroundings, and watching the does play and brouse in the open cut. This went on for almost an hour, then they followed mama as she exited to my right. I had three detonator scent wicks in front of me, hanging from branches, freshly dosed. The doe came directly up to one of them, and sniffed at it a few times, then kept walking. That gave me a good idea that my formula was working and it blended in perfectly. Before too long, the sun was lowering in the sky and I knew the magical hour was approaching... primetime. I normally get up once or twice to sit backwards in my climber, (Summit Backpacker). I like to sit on the rail and look behind me every now and then, it keeps my legs from cramping up, and I stay awake! I tend to get sleepy in the climber, it's comfy for sure! I got up to turn around and had no sooner sat down on the bar, when I looked up and saw a huge buck directly across from me. To my amazment, he was looking the other way, standing broadside. The rack looked massive, like ivory gleaming in the sun. He was 43 yards, standing next to a tree I had previously ranged. I immediately reached to my bow, and wasted zero time knocking an arrow. I actually think I was at full draw seconds later, waiting for the buck to move just a bit and give me a solid shot. He put his head down, sniffed in front of him, took 2 steps, then quickly popped up and again looked the other way. I knew he was curious, and must have heard something that distracted him on the other side of the power lines. That area is all woods, and bedding. As he looked again at the other side, I focused on a clean shot, and squeezed my release until it surprised me, and the arrow was gone. In slow motion, I watched the arrow make its journey and find a hit behind the shoulder, but very high. My first reaction was that I spined him partially. He bucked, kicked, and did a dance I have never seen before. Remarkably, the buck traveled up around and came right down next to me in the woods crossing the small creek. Once he entered the thicket, I heard a lot of crashing and then it went silent. I could see the other side of the thicket, he never made it out the other side. I stayed calm, took a few breaths, and tried to remember exactly what just happened.. It was so fast, I was amazed that I turned around to see him, or I never would have. He was doing what I call the "scamper" to get away. No tail movement, no up and down, just flat out scamper. I realized as I sat down in my climber, that the money I just spent on the Epic Cam was wasted. Not once did I even remember that the camera was on my bow, until the moment was gone. I was really upset, but I pulled it off my bow anyway and began taking a few vids. It was around 5:40pm when he appeared, and I knew time was of the essence. So, i gave it around 30 minutes, before climbing down to retrieve my arrow. Moments before I heard the absolute loudest buck fight ever!!!!!!!! I was packing up my gear for the climb down, when I heard an earth shattering crash. The collision sent chills up my spine, and I froze for a moment, and listened. I heard several loud mean grunts, nothing like I have heard before or anything I could possibly duplicate with a grunt call. It was kind of eerie. After about five seconds, I saw a very tall and wide 8 point exit a lower thicket by the creeks edge, approximately 100 yards away. This was nowhere near the location I last saw my buck, and it made me think that it was my buck, and he was alive and well! I got extremely nervous. The 8 point had huge g-2's, and a very nice rack. It seemed to me that he was trotting away with his tail down, head straight forward, looking submissive to another buck. My next thought was, "Oh my God, there is a bigger buck in this woods?? Maybe larger than the monster I just shot." I got really shook up, took another quick vid, and brought my climber down the tree. I shot the buck at approx. 5:40pm, and I came down at 6:30. The first place I checked was the impact area, 43 yards I believe. I took my time, and found no blood, or my arrow... "Oh no! ", I thought. Light was fading quickly, and I had the idea to go to the creek behind my stand, where I last saw him cross into the thicket. I stayed in that area until darkness was taking over the woods, and I had to go grab my head light. I walked about 10 yards down the small creek edge towards my stand and there I saw my arrow fletching on the ground. It was the top half of my arrow, he had busted it off about 10 inches down the arrow while running through the woods. I saw some blood in the area where I found the arrow tip. I knew it was time for the headlight, and a lot of work tearing through prickers, vines, mud, and thicket! I covered about 50 yards into the thicket, and just before the other side, I saw his rack sticking up about 10 yards ahead. I had all I could do to get back to where he was, and boy did he get all twisted up. He was tangled into all kinds of stuff, and it took about 15 minutes before I got him 20 yards to the other side. I had no idea how large the buck was, until I saw him. I was amazed at kickers and stickers all over his rack, and the g-2's were gigantic! I field dressed the buck, filled out and placed my tag on his rack... smiling from ear to ear! When I got home, I called a good friend of mine, Tim Jones, who owns "Archery Solutions" of Williamson. He offered to help me skin the buck and let me hang it at the bow shop. The Next day, a small crowd seemed to gather at Archery Solutions, and i took my time skinning him out. I also want to thank Sammy, who stayed with me until we got the deer skinned and prepped for the taxidermist. The following day, I delivered the cape and head to "Jim Dorn taxidermy". Jim, in my opinion, is the single most talented taxidermist in the Rochester area, and he is also a GENTLMAN. 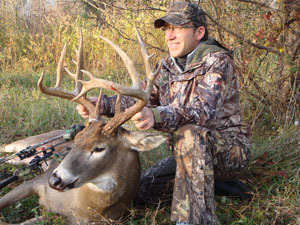 I have had Jim mount previous bucks from my bow hunting adventures, and I am always grateful for the job he does. Truly a fantastic man. This buck has been measured and scored by Paul Adams, NYSBBC measurer, and also a very nice man!! I learned a lot while he scored my deer, and I thank him for spending the time with me. The final score came in at 160 5/8 non-typical. The rack had many deductions due to unbalanced growth and lots of stickers and kickers. I was still very proud of my accomplishment, and thankful he still made the cut for the NYSBBC for 2010. I sent my info and pics to Realtree, via Micheal Wadell, and to my surprise, I was quickly listed on the "Roadtrips" Wall of Fame. It seemed like a chain reaction from that point, hearing from FIELD & STREAM, OUTDOOR LIFE, The DEMOCRAT & CRONICLE, and also FUR FISH & GAME. I made publications in the OUTDOOR LIFE, March issue, page 9. And my biggest accomplishment was Making FIELD & STREAM'S top 50 bucks of 2010. I was given the honor of receiving the #35 spot for 2010, nationwide. This has been a life accomplishment for me, and I am really thankful to every single person that helped me through the process. I received a call last week from Jim Dorn, stating that my buck is just about finished. I can hardly contain myself and I am really looking forward to seeing him again. Over the course of the winter, many people have developed a name for the buck, and it seems his nickname has been deemed, "CACTUS- JACK". Quite fitting I thought. And accepted gladly. I want to say thank you to Joe Servello, for the opportunity to share my story with the hunting community. I look forward to meeting Joe at the banquet for NYSBBC this year. I was contacted about a month ago. My cousin works locally in Rochester, and has many co workers which are hunting fanatics! A gentleman approached my cousin Patrick, and gave him a very cool picture. 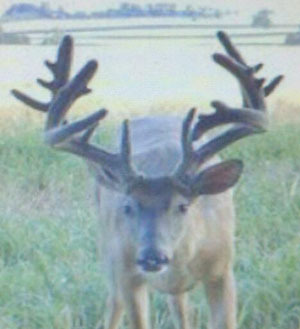 He came across a bunch of trail cam pictures in a local online forum, and one of the pictures was MY BUCK for sure! Once I recieved the photo, I knew right away it was Cactus Jack! I was so happy and thankful to see him in the summer, in full velvet, looking straight at the camera... a gift from above. I still do not know who got the photo, but I want to say thank you to whoever you are. Its one of the best trail cam pics I have ever seen. Very much appreciated. I am already excited for another bowseason fast approaching, and I have made the decision to stay with BOWTECH. I shoot the "Admiral" series, and it has served me well. I use RAGE broadheads, and let me tell you, they do a very good job! The hit was high, just under the spine, and thanks to RAGE, the buck only made it 125 yards before it was over. Very pleased with the results. The DETONATOR scent wicks are fantastic!! They are over 12" long, and I believe they dispurse alot more scent into the area, bringing in the big boys! I will continue to use them on my journeys in the woods. Lastly, if you have the opportunity to hunt the outskirts of suburbia, I suggest doing so. The hunting pressure is extremely low, and big bucks sneak into these areas to hold up and breed with a very large population of doe. It pays off, if you don't mind the noise of highways, the occasional cross country runner that passes by, or the local people taking hikes in the wilderness. Believe me, it will happen, just stay calm, and let people do their thing. The big bucks are right under your nose, all you have to do is stay true to your spot, and sooner or later, that big boy will appear out of nowhere, and present the shot of a lifetime! Just make sure you are ready to make that shot, in an instant. After hearing the buck fight moments after I shot my buck, last season, I am confident that two other big bucks are still in the area, and I cannot wait to get back out there this year, and go after them!